I met Bob Bevington a couple of years ago. He and I both somehow ended up at a youth conference and we began to chat while walking from the venue to a nearby hotel; we were the only adults around so we must have naturally gravitated toward one another. We were surprised to learn that we were both under contract to write a book–I was writing The Discipline of Spiritual Discernment while he was working with Jerry Bridges on a book they were to co-author. 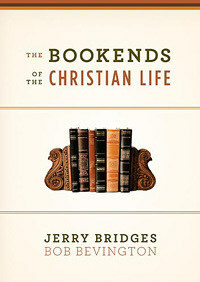 Since that time he and Bridges have written two books together, the second of which is The Bookends of the Christian Life. This book relies upon a metaphor that extends from cover-to-cover: the metaphor of bookends. I think we have all experienced the difficulty of putting books on a bookshelf without using any bookends. You know what happens. The books on the end inevitably tip over and once they fall, the ones beside them fall too. Soon the whole line of books has tipped over and several of them may have crashed to the floor. The solution, of course, is to install a couple of sturdy bookends on either side of the shelf. This will support the whole row, keeping them right where they are supposed to be. The authors dedicate half of this book to each of the two bookends. In the first half they look at the righteousness of Christ as a means of assurance in our day-to-day relationship with God. It is only because of the righteousness of Christ that God can see us as righteous. As our sin was transferred to Christ on the cross, his righteousness was credited to us. And so we live now in the present reality of being justified before the Father. In the second half they turn to the power of the Holy Spirit to fight with us and for us as we battle against indwelling sin. Here we see both the Spirit’s monergistic work in giving us new life, in giving the gifts of repentance and faith, but we also see the necessity of synergistic work where we cooperate with the Spirit in putting sin to death (though obviously this is a qualified, uneven synergism much in the same way my six year-old daughter may help me shovel the driveway). In each case Bridges and Bevington look to gospel enemies that can cause our books to begin to tip over and in both cases they offer a series of focal points that will help the reader keep his life and his faith focused on that particular bookend. As he progresses, the reader will find answers to such questions as: How can I overcome persistent guilt? How can I deal with the pressure to measure up? Where can I find the motivation it takes to grow? How can I live the Christian life with both my head and my heart? How can I be sure God loves me? How can I change in an authentic and lasting way? In The Bookends of the Christian Life Jerry Bridges and Bob Bevington look at the Christian life through a wide-angle lens, examining the framework that supports, stabilizes and secures the believer’s life in Christ. They teach elements of a distinctly biblical worldview, leaning upon the righteousness of Christ on one hand and upon the power of the Holy Spirit on the other. This is a deeply pastoral book that constantly encourages the reader to look to Christ and to depend on the Holy Spirit. I have read it twice and have benefited from it both times. A wise and powerful book, it is one I heartily recommend.